The size of the average web video has more than tripled since 2003. Website Optimization surveys the video landscape to show that the size, duration, quality, and usage of the mean web video has grown significantly over time. As bandwidth has grown so has the size and complexity of web sites. With the advent of YouTube, Vimeo and the like video streaming media has grown in popularity. Website Optimization surveys the video landscape to see how video size, duration, and usage on the web have grown over time. The duration of the mean web video has grown significantly since 1997. In 1997 the length of the mean web video was a mere 45 seconds long (Acharya & Smith 1998). In 2003 the mean web video grew to about 120 seconds long, or 2 minutes (Li et al. 2005). By 2007, the median video was 192.6 seconds in duration (Gill et al. 2007). In 2010 the mean web video was 270 seconds long in duration (Karki 2011). Meanwhile, the bitrate and dimensions of the mean web video has grown from 200Kbps in 2003 to 300Kbps in 2010. So the file size of the mean web video has more than tripled from 2003 to 2010. For his Master's Thesis "Fresh Analysis of Streaming Media Stored on the Web" at Worcester Polytechnic Institute Rabin Karki customized a crawler to analyze over 20 million URLs (Karki 2011). 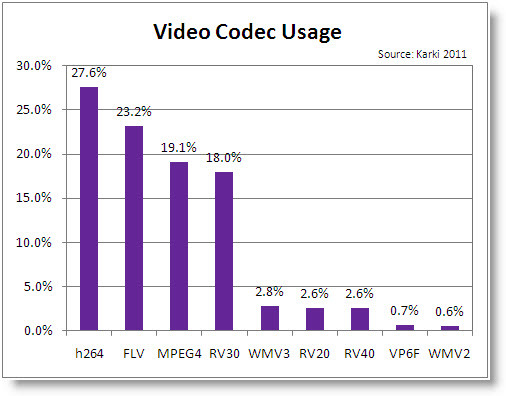 Karki found that Advanced Video Coding (H.264) made up about 28% (27.6%) of the videos codecs found (see Figure 2). H264 is used in a variety of popular applications including YouTube, iTunes, Adobe Flash and Microsoft Silverlight, broadcast services, and cable television services. Second place goes to the Flash Video (flv) codec, a container format used to deliver video on the Internet using Adobe Flash Player versions 6 to 10. This technique is used in YouTube, Hulu, Google Video, Yahoo! Video, and MetaCafe. MPEG4 came in third at 19.1%, following by versions of Real Video and Windows Media Video codecs. A total of 36 video codecs were encountered in the analysis. The median file size of all the videos analyzed was 8MB. The median encoded video bitrate was 0.3Mbps. This is up from the 200Kbps encountered in the 2003 study by Li et. al, but well below studio quality videos (3-6 Mbps) and HDTV quality videos (35-34 Mbps). About 55% of videos encountered had resolutions of 320x240, about 30% had resolutions above 320x240 and at or below 640x480 pixels. As bandwidth connectivity grows, so does the size and complexity of the average web site. Audio and Video files are growing steadily with bandwidth. 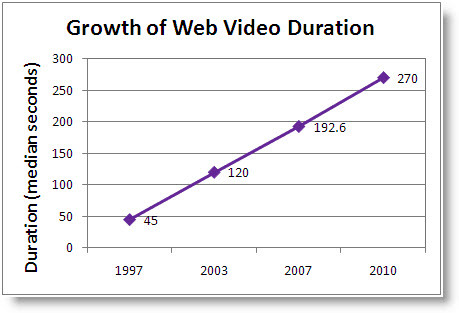 The duration of the mean web video has grown by 2.35 times from 2003 to 2010. With the average bitrate growing from 200Kbps to 300Kbps over the same time period, and the dimensions growing as well, the file size of the average web video is growing at a faster clip (the mean videos file is at least 3.375 times larger in 2010 than it was in 2003). The codecs are also changing over time. In 2003, streaming multimedia was dominated by Real Network's RealMedia, Microsoft's Windows Media, and Apple's QuickTime. Now these three codecs have been replaced by newer media formats, with about 70% consisting of either AAC, FLV, or MPEG-encoded videos. Acharya, S., and B. Smith, "An Experiment to Characterize Videos Stored On the Web,"
in MMCN 1998 (San Jose, CA: Jan. 1998), 166-178. Gill, P., Arlitt, M., Li., Z., and A. Mahanti, "YouTube Traffic Characterization: A View From the Edge," in IMC 2007 (San Diego, California: October 24-26, 2007), 20. About 24% of videos are interrupted because of poor performance or poor content quality. Karki, R., "Fresh Analysis of Streaming Media Stored on the Web,"
Master's Thesis for the Worcester Polytechnic Institute, Jan. 2011. "Video resolutions have significantly increased since 2003. In 2003, less than 1% of the videos had resolution higher than or equal to 640 x 480, while now more than 10% videos have resolutions higher than or equal to 640 x 480." Apple is closing the gap with Microsoft in streaming media player share. By sometime late 2011 or 2012 Apple should pass Microsoft in streaming media player users. April 2011 Bandwidth Report. With its acquisition of YouTube, Google now dominates the top ten video sites on the Internet in unique users, stickiness, and growth. July 2007 Bandwidth Report. YouTube continues to dominate the top ten video sites, with over 77 million viewers in July. August 2008 Bandwith Report. Li, M., Claypool, M., Kinicki, R., and J. Nichols, "Characteristics of Streaming Media Stored on the Web," ACM Transactions on Internet Technology 5, no. 4 (2005): 601-626. In 2003 Li found that 29% of videos were encoded for modem bitrates. Also found that nearly half of the videos had resolutions of 320x240 pixels or less. In 2003 the median bitrate was 200Kbps. 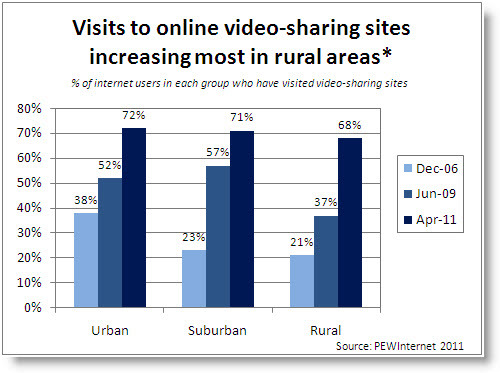 Fully 71% of online Americans use video-sharing sites such as YouTube and Vimeo, up from 66% a year earlier. July 26, 2011. Website Optimization provides services and techniques to improve web site performance: boosting search engine visibility for more traffic, increasing conversion rates to maximize leads and profits, revving up site speed to retain users.